As universities and high schools have gone back into session these past few weeks, students pursuing a criminal justice degree or those interested in doing so after high school should always stay up to date on the latest research, theories and popular themes found within CJ literature. In fact, reading outside of your required courses is only going to help you and will give you the freedom of reading books that you want, not just books that you are required to read. Plus, it gives you something extra to add to classroom discussions and something extra in the discussions can go a long way when it comes to grading for many professors. For many students studying criminal justice, their plans may include a career within a local, state or federal law enforcement body. Without a doubt, this path is highly rewarding on a personal level. As a law enforcement professional, the ability to help others and to keep the community safe are motivations and the primary reason why many of you will go down this path. But it should be noted that it is not an easy path, for you or for your loved ones. 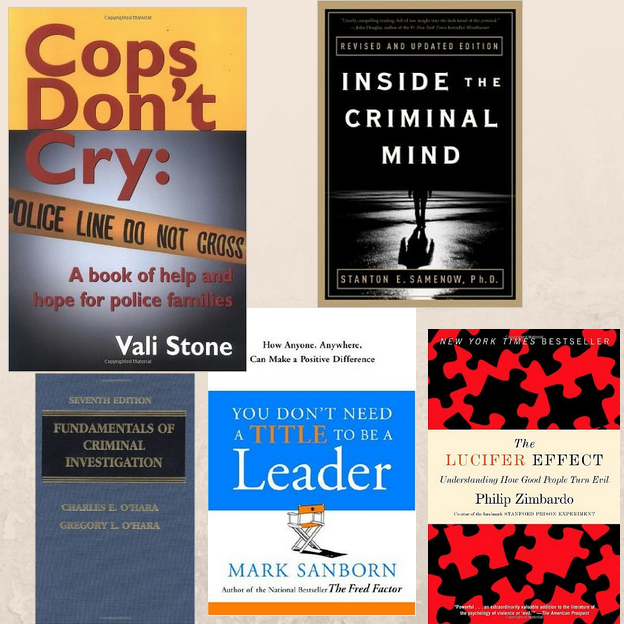 Vali Stone’s Cops Don’t Cry, a must read for those looking to go into law enforcement, was written with the idea of helping police officers and their families cope with the realities of such a career. Mrs. Stone herself was the wife of a police officer. The challenges that police officers and other law enforcement agents come across are misunderstood by those closest to them, and often times it isn’t for a lack of trying to understand. Although not exactly aimed at criminal justice students, Mark Sanborn’s You Don’t Need a Title to be a Leader, can still be applicable. Whether it's currently while as an undergrad or graduate student, or even within a forthcoming career, anyone can strive to be a leader. Using relevant examples of individuals who have stood out for their leadership, Sanborn details how an actual title doesn’t make one a leader. Instead, the ability to properly lead is demonstrated by actions and how those actions influence those around us. In the criminal justice field, leadership is always needed and particularly in situations where the safety of others is dependent on how well we can execute our duties. Inside the Criminal Mind is a fascinating book and one that many students may be familiar with as it is often used by criminology professors. Dr. Stanton Samenow presents a rather controversial view on crime, one that rejects the long standing theory on certain environmental factors being the motive for criminal behavior, but nonetheless he backs his position with over 30 years of research. Dr. Stanton Samenow has argued that criminality is not due to those outside factors but that future criminals all possess a certain mind-set that is evident even in childhood. His work has lead to many states adopting new ways of treating criminals, revamping their rehabilitation programs to accommodate for Dr. Samenow’s methods. If you already work in law enforcement, I wouldn’t be surprised if you know about this book or if you have a copy already. And if you are just a student, on the odd chance that none of your professors will require this reading, then you should get your hands on a copy of O’Hara’s Fundamentals of Criminal Investigation. In fact, many seasoned veterans within the field have credited this book with giving them the necessary skills to continue propelling their careers forward. The name Philip Zimbardo should sound familiar. Professor Zimbardo of Stanford University is the creator of the Stanford prison experiment, which showed a relationship between an individual’s behavior and the situation he or she may find themselves in. In the well known experiment, the subjects who played the role of guards were given authority over those playing the role of prisoners and the researchers observed, much to their shock, how far the “guards” went in using the authority they now found themselves in possession of. The Lucifer Effect is Zimbardo’s response to those findings, which seem to challenge the book listed above by Professor O’Hara. Zimbardo rejects the idea that people can be classified as either good or bad, because we can act in either form depending on the situation. Zimbardo goes on to explain that although personal characteristics can influence criminal behavior, “Good” people can still be influenced into such heinous behavior by outside forces. Adam Quirk, MCJ & MBA, has nearly two decades professional experience in the criminal justice field, as well as advanced degrees in Criminology (MCJ) and Business Administration (MBA).